Enter some data in the Dim. grid of the Packages tab. To speed up the operations, open the document created in Tutorial 1 with the File → Open menu command (shortcut key Ctrl+O) or the tool. After opening, delete the solution with the Solution → Delete Solution menu command. 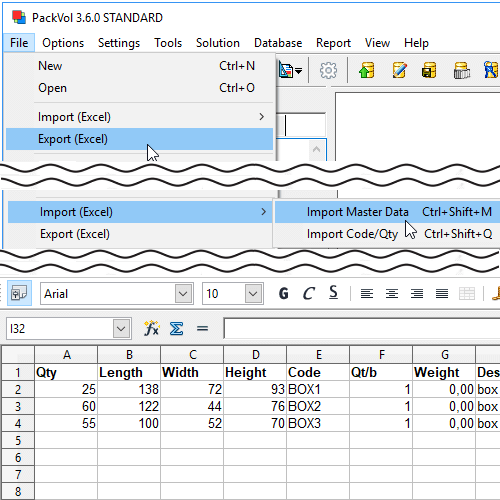 Export to Excel file with the File → Export (Excel) menu command. Open the exported file with your preferred spreadsheet. Edit the file by referencing the headers and data that are present. Enter at least quantities and dimensions. Save your changes. Delete the changes made with the File → New menu command (shortcut key Ctrl+N) or with the tool. Import data with the File → Import (Excel) → Import Master Data (shortcut key Ctrl+Shift+M).